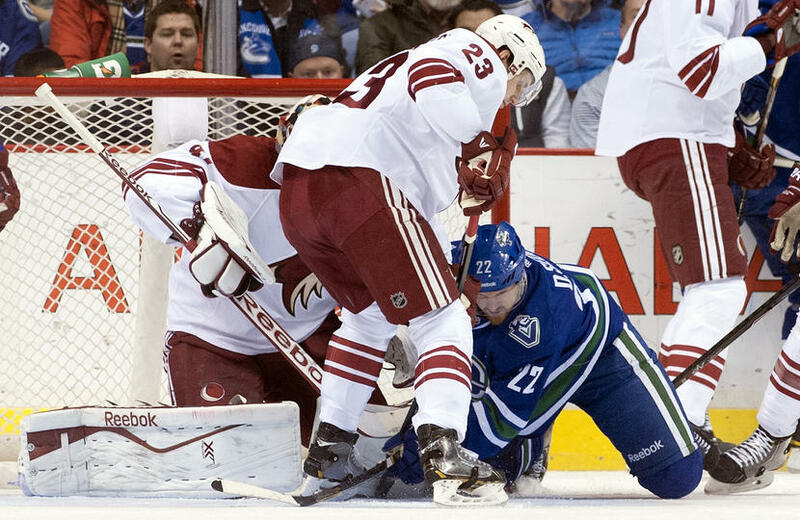 Just like their recent play, Daniel Sedin struggles in front of the Coyotes net. After last night’s embarrassing 9-1 loss to the Anaheim Ducks, the Canucks are hoping to redeem themselves tonight against the Phoenix Coyotes. You’ve all heard the narrative by now that January hasn’t been kind to the Canucks. And with a single win in January – and a 1-4-3 record in their last 8 games – you wouldn’t hear many Canucks fans arguing against it. However, despite their struggles, the Canucks still hold one of two wild card spots in the Western Conference. They currently occupy 7th place in the conference, 6 points up on tonight’s opponents, the Coyotes, and with 2 games in hand. Part of the reason the Canucks have managed to stay up on the Coyotes is that the ‘Yotes themselves have struggled recently. Phoenix has lost 4 consecutive games and have a 2-6-3 record in their last 11 games. This is the third of five meetings between the Canucks and Coyotes. They split their first two meetings of the season, with the Canucks winning the more recent match-up on December 6th. Having scored a grand total of one goal in their last 2 games, I’m not sure if any Canucks qualify as being hot. Though, Zach Kassian did score again last night, his 2nd goal in 4 games, and he now has a career-high 9 goals this season. Like the Canucks, the Coyotes are struggling on the scoresheet. Coyotes defensemen Oliver Ekman-Larsson, after going goal-less for 23 games, has scored in back-to-back games – his team’s only goals in their last two games. Canucks goalie Roberto Luongo still remains day-to-day. Forwards Alex Burrows (broken jaw) and Jordan Schroeder (ankle), and defenseman Andrew Alberts (concussion) and Ryan Stanton (ankle) are on injured reserve. Coyotes defenseman Zbynek Michalek (lower body), who hasn’t played since December 17th, is still out and there is no timeline for his return.